t’s hardly surprising then that they decided to produce a sequel. This moves the action from Edwardian England to the WWII era, but time does not appear to have appeased the evil entity that resides at Eel Marsh House. The house has long been abandoned, but in light of the frequent bombings on London, a decision is made to evacuate a group of children there. They are accompanied by their teachers, Eve (Fox) and Jean (McCrory) who will stay with them until it is safe to return. En route, they meet a dashing military commander Harry (Irvine) who is stationed in the area, and he strikes up a friendship with Eve and promises to visit the rag tag group. Upon arrival at the house, they are horrified by the conditions of their surroundings, which have fallen into disrepair, but are told there is nowhere else they can go. Making the best of it they bed down, but one by one the children begin to act strangely, and tragedy and disaster strike. Eve is convinced there is a sinister force at work, and enlists Harry to help her get the children to safety. However, the Woman in Black is not prepared to let her prey go that easily, and Eve and Harry have to put their lives on the line in an attempt to save the children from her evil clutches.. The one thing Hammer always does really well is that ‘jump out of your seat’ moment, and there are plenty here. You will find your heart in your mouth plenty of times throughout this. They cleverly use light, shadow, sound, and suggestion to create these effects, and they are as effective here as they always have been. That said, one of the things that makes other incarnations of The Woman In Black so terrifying is the fact that although you always know she is there, you don’t actually see the entity, until the end of the movie. As we all know, that which is unseen is far creepier than something in your face. Therefore it is surprising that they have chosen to reveal her here quite early on. Perhaps they are thinking that people already know what she looks like, and her back story, thanks to the previous film, but the reality is that not everyone who watches this will have seen that, and it does remove some of the suspense when you are exposed to her early in the film. What really holds this together is a steely performance from Fox as the tortured Eve, who is hiding shameful secrets of her own, and is prepared to do whatever it takes to save her charges. She works well with McCrory, and the two have some lovely scenes together. Irvine looks appropriately handsome as the dashing Harry, who is also not all that he seems, but unfortunately he chooses to play him as somewhat of a stiff upper lip cliché, although he does redeem himself somewhat in the final 20 minutes of the film. It is rare nowadays that a horror relies on good old fashioned spine tingling chills, rather than huge special effects, which makes this somewhat refreshing. While there is indeed a certain amount of movie trickery employed, it doesn’t impose on the film, and the majority of the scares come from old school techniques. The story isn’t as strong as the original, and at times is predictable. 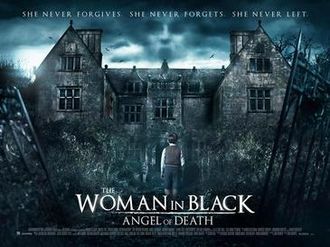 There is a bit too much of the titular Woman in Black to make her a truly eerie presence. However, if you are looking for an old school chiller that will send a shiver down your spine, then this is the movie for you.